Two small storage cubes and one inside pouch to keep your products organized and protected. When it comes to investing in travel, there are a million things to consider. 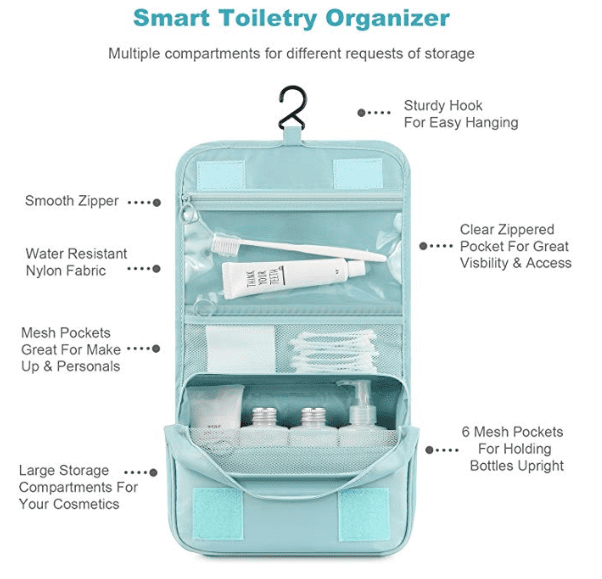 Your toiletries and skin health are some of the most important, so many travelers want to find one of the best toiletry bags for all their personal care items. TSA regulations state that all carry-on liquids must be 3.4 ounces (100ml) or under, and it’s up to you to figure out how to make that happen. A good toiletry bag will help. Here are the top 5 best toiletry bags and everything you need to know about buying one. If you’re looking for the cheapest toiletry bag, a plastic sandwich bag is the most affordable option. They’re cheap, waterproof, and even TSA-approved. The downside is that sandwich bags can’t hold much and you’ll only be able to use the bag once or twice. However, if you’re willing to spend a little bit of money but still keep to a budget, check out the inexpensive HaloVo Transparent Toiletry Bag. The bag is clear, which means you can see what you’ve packed. Plus, it’s made of PVC and PVU leather materials, so clean up is easy if something spills during your travels. Medium size: This bag is medium-sized, measuring 9.4″ x 3.3″ x 7.9″. Top-side zipper: Your bottles can stand upright to reduce the possibility of spills. You can also avoid unpacking everything because you can set the bag on the bathroom counter and quickly pull out what you need. Transparent: The bag’s transparency makes it easy to see what’s inside without having to open the bag. It also makes spills easy to spot. Aesthetics: This isn’t the most beautiful toiletry we’ve come across. However, if usability is your top priority, this bag will give you what you need. No compartments: If you want a bag that can help you stay organized, this isn’t it. There’s one large compartment instead of multiple useful pockets. We love hanging toiletry bags because they keep us organized. These bags typically have multiple compartments for makeup, liquids, cotton balls, and other personal care items. Plus, when you reach your final destination, you can hang it on the back of a door (as long as there’s a hook) and never worry about unpacking it. Hundreds if not thousands of hanging toiletry bags are on the market, but you don’t have to spend a fortune to get a good one. Amazon has plenty of affordable hanging toiletry bags that rival even the most luxurious. 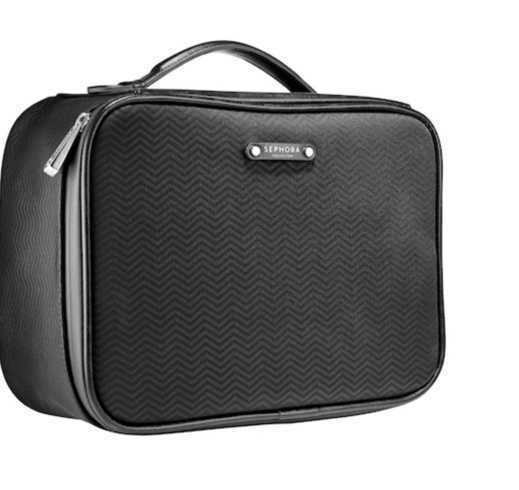 Mossio’s is our top pick for a hanging toiletry bag. It is large and features multiple compartments to keep your toiletries organized. It measures 9.45″L x 7.48″ W x 3.74″ H and has outside pockets for easy access when the bag is closed, interior compartments, and even a front zipper pocket for extra storage. Affordable price: Generally costing around $20, this is one of the cheaper toiletry bags on our list. 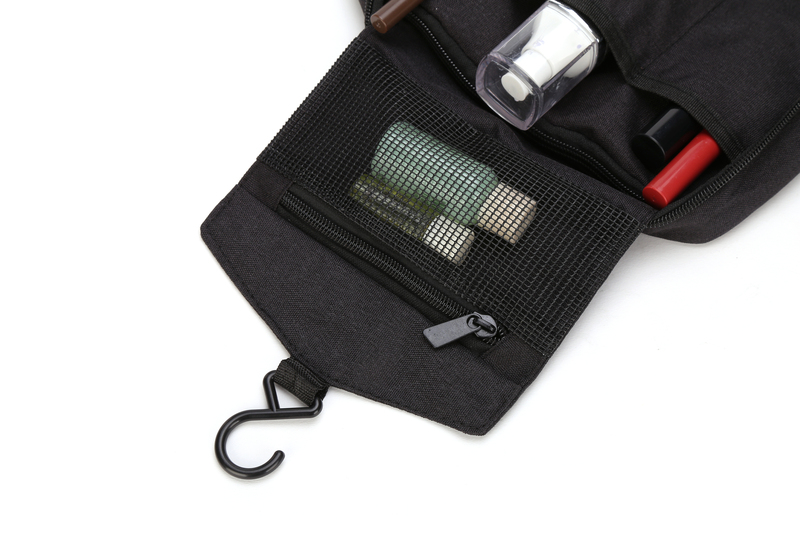 Durable: This toiletry bag is made of sturdy, water-resistant, polyester fabric and antimicrobial mesh. Lined interior: The interior pockets are lined to help prevent leaks. Multiple compartments: The Mossio hanging toiletry bag features more compartments than most because it features pockets both inside and outside. Large pockets are located outside, which allow for easy access. Three interior compartments keep your makeup and travel toiletries organized, and a front zipper pocket provides even more storage space. Multiple patterns available: This bag is pretty. It comes in a variety of colors and patterns, so there is something for everyone. 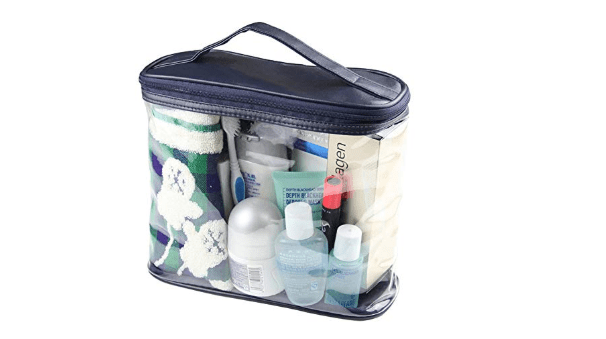 TSA-approved: You’ll easily clear security with this TSA-approved toiletry bag. Large size: This is a big bag, so if you are looking for something you can easily fit into a weekend duffle bag or carry-on suitcase, you may have problems. Thin see-through pocket material: One of the pockets is see-through and made of thin material. If you put a nail file or other sharp object inside, the pocket might tear. If you’re a makeup fan and are horrified by the thought of leaving home without your full collection of bronzers, highlighters, and concealers, Sephora’s Pack It All Organizer could be the best toiletry bag for you. Made of soft materials, the bag contains two removable zippered packing cubes as well as a flat cosmetics pouch. It also has a brush holder to protect your makeup brushes. The bag measures 7 1/2″ H x 9.75″ L x 5″ H, so it’s best for checked bags. Affordable price: This is one of the cheaper toiletry bags on our list. Cube shape: If you use packing cubes, the shape of this bag enable it to fit seamlessly amongst your other cubes. Optional accessories: While the bag comes with three inserts, Sephora has additional accessories available for purchase should you prefer something different. Palette sizes: If you have a Sephora lip or eye shadow palette, it will easily fit inside the bag. Plastic-lined inserts: The inserts are lined with plastic so that any spills will stay manageable. Storage compartments: The bag contains two small storage cubes and one inside pouch, all of which are removable. Thick material: While it is a softshell bag, the material is thick enough to protect the contents inside. Not sized for hairbrushes: This bag is not large enough to hold hair brushes. Softshell material: A softshell means it’s not entirely safe from rough baggage handlers, so there is a chance something might crush your bottles. If you don’t need a lot of beauty products or you just need to invest in a small but quality toiletry bag, Eagle Creek has you covered. The exterior is a poly micro-weave that is stain-resistant, and it’s interior is lined with a water-repellent material. Should any spills occur, your toiletry bag won’t be ruined because you can throw the pack in the washing machine. Plus, the bag has compartments! They’re small, but the Pack-It Quick Trip contains two external mesh pockets to help keep your travel toiletries separate. Affordable price: The cost of the toiletry bag won’t break the bank. Color options: This bag comes in a variety of colors, including blue, green, black, red, and white. Lightweight materials: This bag weighs three ounces, so it won’t weigh down your luggage. 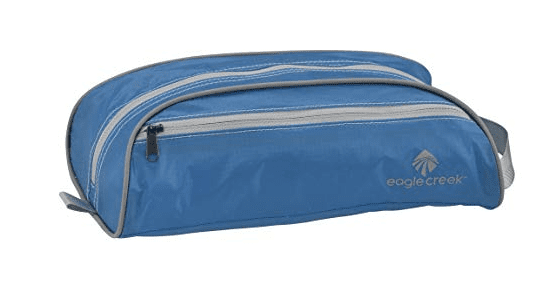 Matching packing cubes: Eagle Creek also makes some of our favorite packing cubes, so if you want your toiletry bags to match your packing cubes, we highly recommend this set. Few compartments: While the bag does have a few compartments, they’re small. You won’t be able to separate multiple large products. Clear toiletry bags aren’t the most stylish, but they are the most practical. Not only can you see all of your products, but the plastic makes cleaning a breeze. 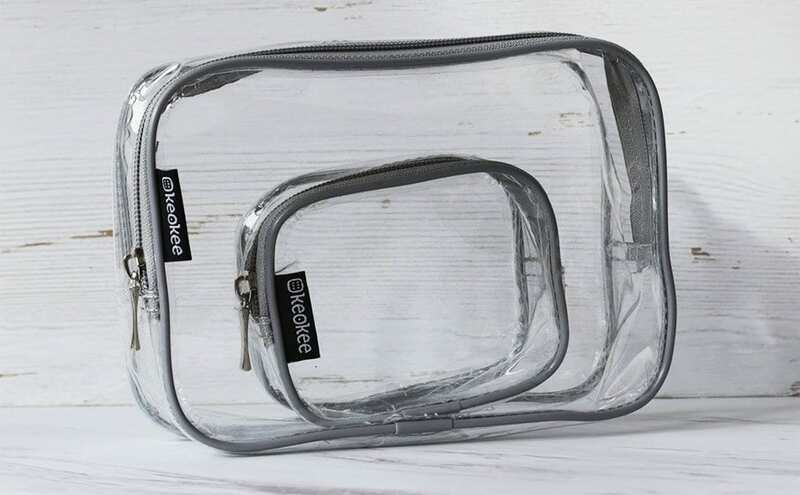 If you are simply looking for a clear toiletry bag and don’t want to spend a lot of money, our top pick is the Keokee Clear Toiletry Bag Set. Two clear, plastic toiletry bags come in this set: one large, TSA compliant bag, and one smaller bag perfect to keep in a purse or put smaller items in should you not have enough room in the larger bag. Affordable price: This set costs less than what most people spend in a week at Starbucks. Durable materials: This bag has double stitching throughout and high-quality zippers. Easy cleanup: If anything spills inside or outside the bag, simply rinse the bag under the nearest tap to clean it. Small size: Even the large bag is relatively small, measuring only 8″ x 5.5″ x 2.5″. TSA-Approved: The larger bag is TSA compliant for 3-1-1 liquids. Basic looking: If you’re looking for a pretty toiletry bag, this isn’t it. It’s as basic looking as you can get. No compartments: This is a simple bag. 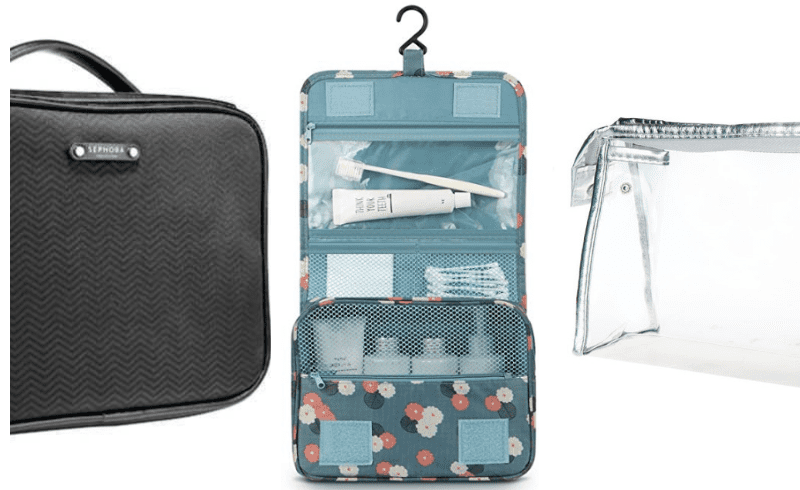 If you are looking for a toiletry bag where you can separate your makeup brushes from your other beauty products, consider a different option. 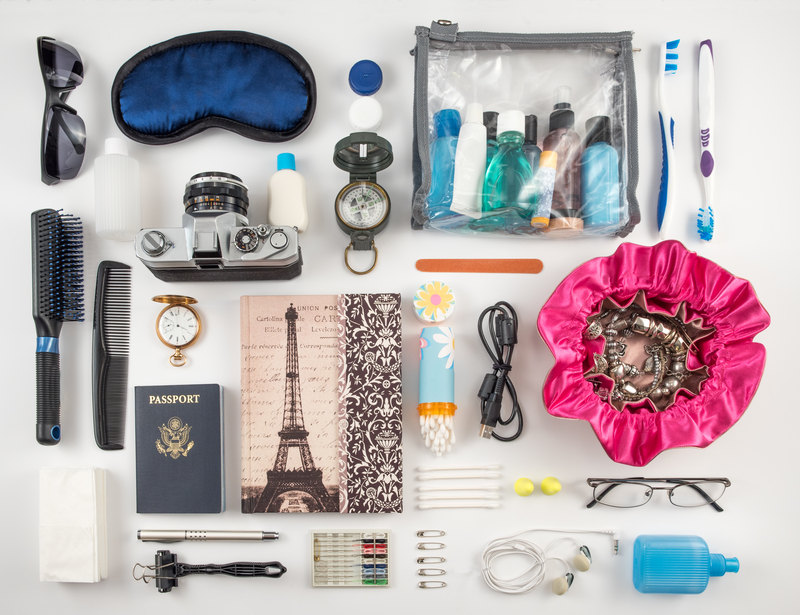 There are a lot of things to consider when looking at travel toiletry bags. Here is a guide to the most important things to consider. How big your toiletry bag is might depend on the type of trips you take or if you choose carry-on vs. checked bags. If most of your travel consists of weekend trips, you’ll likely want to pack as efficiently as possible. This means a small carry-on or duffle bag, which also means a small toiletry bag. If you’re checking a bag, you’ll have extra space. However, you will have to decide if you want to dedicate that space to a large toiletry bag. The truth, the ideal size for your toiletry bag is subjective. If you tend to use a lot of beauty products and don’t mind taking up the space, a large toiletry bag would be ideal. If you’d rather save space or you only have a few personal items to bring on trips, a small bag will work fine. If you like to keep your space as organized as possible, chances are you’ll prefer a toiletry bag with multiple compartments. You can put your liquids in one compartment, your powders in another, makeup brushes in a third, and so forth. This helps you keep your items organized and easy to find. Almost all hanging toiletry bags have multiple compartments, but even large and small non-hanging bags can come with removable storage cubes to help keep you stay organized. If you’re okay throwing everything in one place, you don’t need to prioritize finding a bag with compartments as much as you would if you want to know exactly where each item is. There are two main types of toiletry bags: hanging and non-hanging. If you stay in hotels: You may prefer a hanging bag because hotels typically have hooks you can hang bags from. If you stay in friend’s houses or Airbnbs: You may want a non-hanging bag. Not all homes have bathroom hanging hooks for robes and toiletry bags. If you switch types of places you stay frequently, consider which type of bag you like best or which will more often be convenient for you. Also, note that you can sometimes find other places to hang a toiletry bag than a bathroom hanging hook (like on the edge of a chair), so don’t be afraid to try a hanging bag if you want it even if you don’t know if hooks will be available. 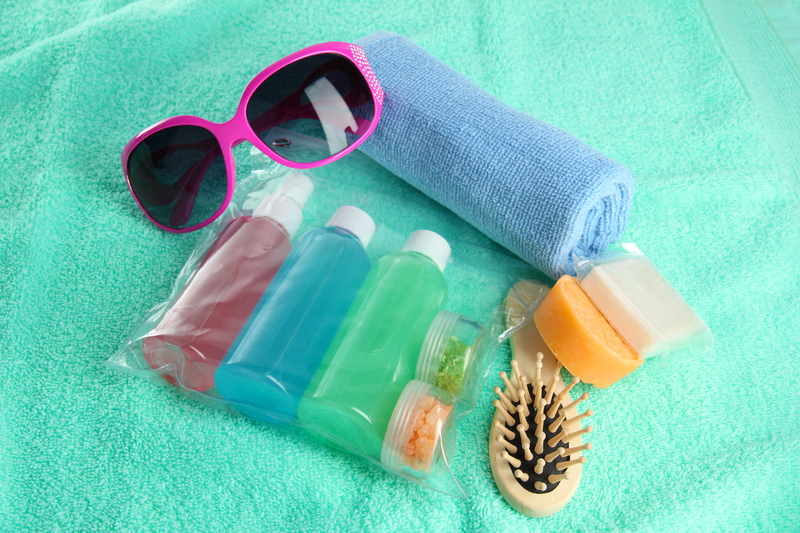 Material is one of the most important considerations in a toiletry bag. Is the exterior easy to wipe? Is it tough and will protect the contents inside? Could the material on the inside be easily cleaned with a makeup cleaner or wet towel? Some bags may also be made from other materials. 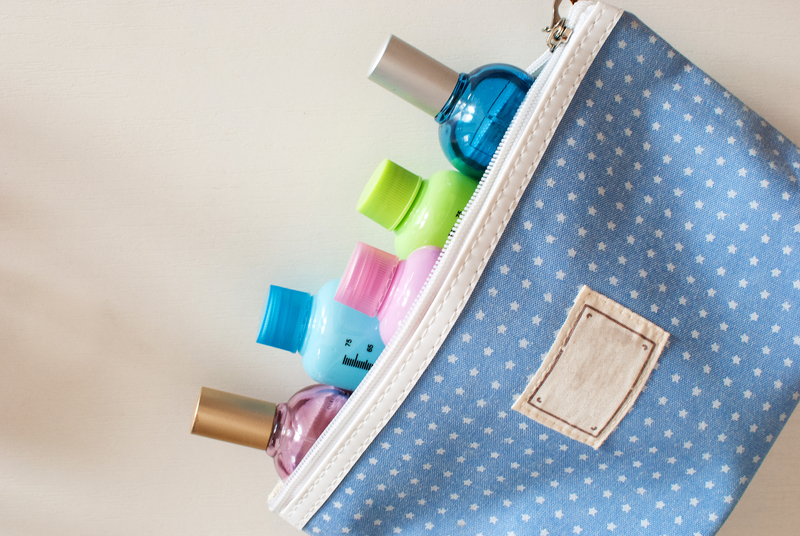 Look for details like a waterproof lining to keep your personal care items from spilling. While it may seem luxurious, silk is the worst type of material for a toiletry bag. It’s not machine washable and it’s not strong enough to withstand the potential pressure put on your bag. Imagine your perfume spilled, your serum leaked, and even your tinted moisturized spilled a bit. The bag would be ruined! Similarly, leather toiletry bags might get ruined unless the inside is coated in something that will protect the leather from spills. Therefore, we recommend staying with the materials we listed above. While this is less important than form and function, many people care about what the bag looks like. Do you prefer it to be a solid color, patterned, or even clear? Do you want it to match the rest of your luggage set? Do you want it to be subtle or are you okay with it being bold? These kinds of questions can help you find a style that will work for you. 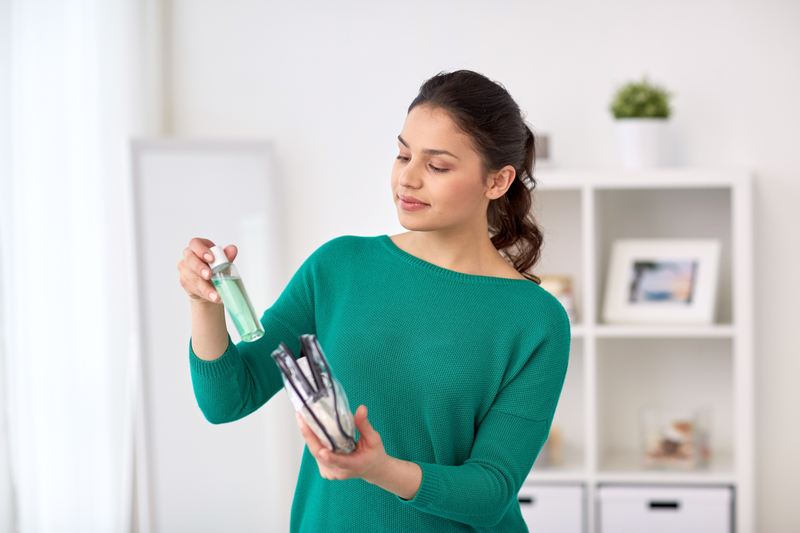 The exact toiletries you need depends on your preferences, but most people will need the same types of personal care items. If you’re happy with the above, a small toiletry bag will likely suffice. If you’re the type to back both the bare minimum and your makeup essentials, you’ll likely want to invest in a larger toiletry bag with compartments. Also keep in mind that flying on an airplane is like a trip to the desert: the humidity is only around 20%. Skin is most comfortable with humidity levels between 40% – 70%. As such, you need to have a few extras to keep your skin hydrated when you’re 40,000 feet the above ground. 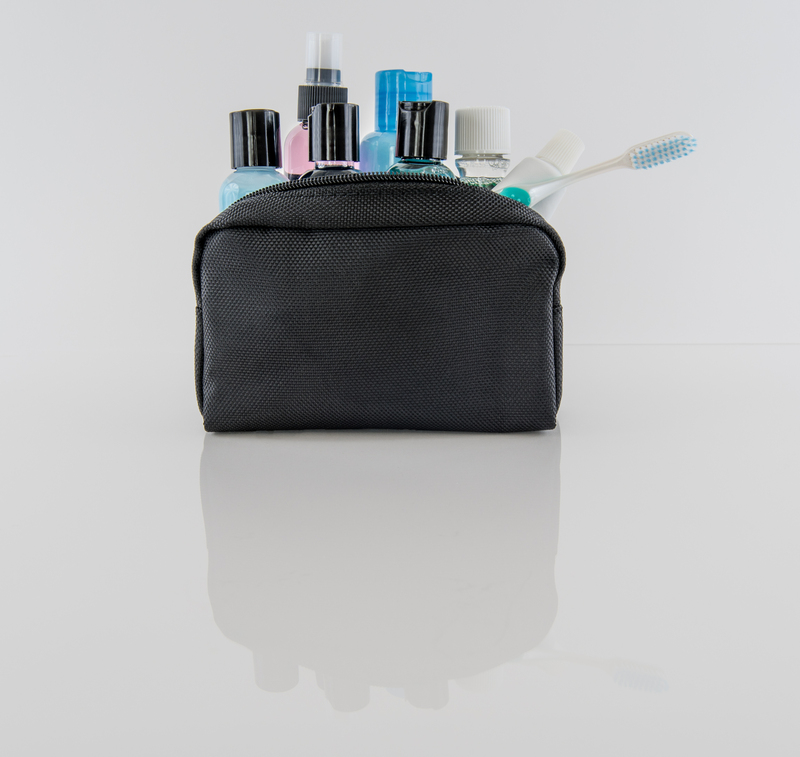 If you check your main toiletry bag, you may also want to invest in a small toiletry or makeup bag with essentials for during the flight. Again, if you have a lot of extras, consider a larger toiletry bag and one with compartments to keep things separate. Whenever possible, we recommend using a carry-on bag for travel. Traveling light means you have less room for clothes and travel accessories, but you’ll save money, get out of the airport faster, and won’t risk the airline losing your bag. One of the biggest challenges with packing a carry-on, however, is space optimization. Squeezing multiple outfits into a small bag is hard enough, so you may not know how to pack a toiletry bag in your carry-on too. 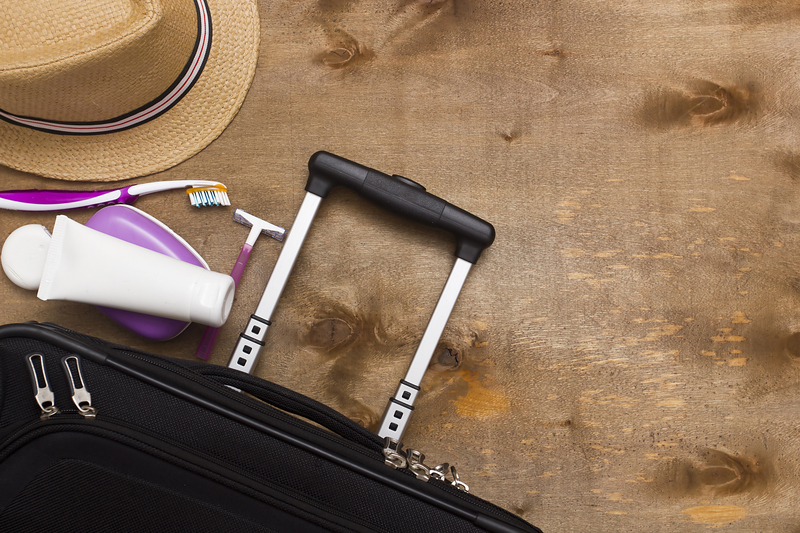 Here is the best tips for packing toiletries in your carry-on. It should be small so it doesn’t take up too much space in your luggage, and its contents should be small as well. Some airports require you to put your liquids in a clear plastic bag while others don’t. Look to see which your airline requires. If they don’t have a rule, choose whichever you prefer. Buy travel-sized or get sample products: We like this option for a few reasons. It allows us to bring micro-versions of our favorite products, lets us try new products, and lets us throw the bottles away when they’re empty (leaving more space in the bag for the return home). One way to do this is to buy a toiletry kit from a store. Or, if you have a favorite beauty store, ask the salesperson if they have samples you can have. Tell them you travel frequently and love their products, but you don’t have space to bring their full-sized items in your carry-on. If they want to keep you as a customer, they’ll likely give you a few. Purchase travel bottles: One option is to purchase travel bottles and fill them with your favorite products. The benefit is that these bottles are refillable and will save you money over time. The challenge is remembering what type of product is in each bottle, as they’re not always labeled. Also, it can get messy to fill them and not all products will squeeze into a separte bottle. Subscribe to a beauty box: If you’re open to trying new products, consider subscribing to a beauty subscription box such as Birchbox or Play! by Sephora. You can get shampoo, conditioner, facial serums or lotions, and so much more. It’s one of our favorite ways to try new products and the sample sizes are perfect for travel. 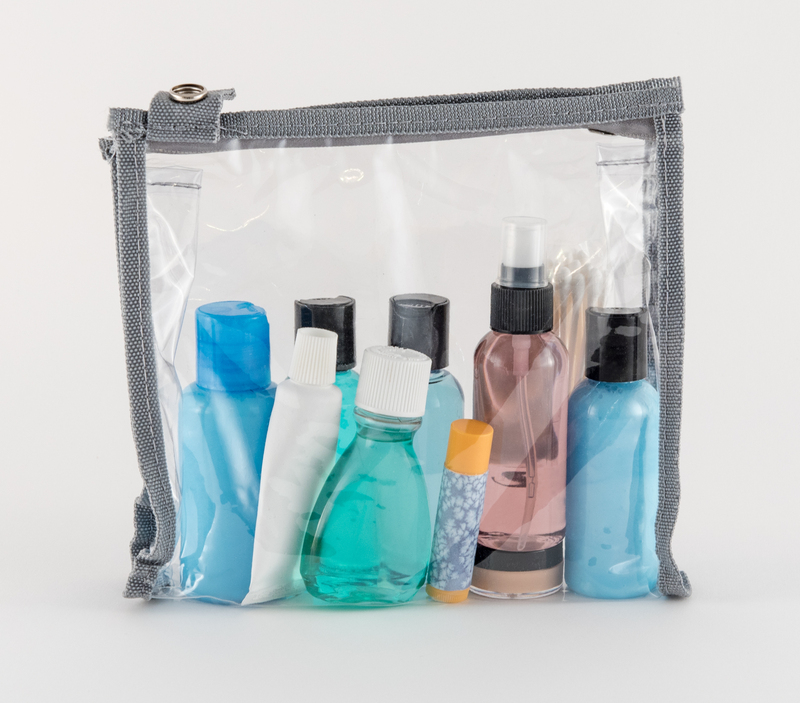 After your toiletry bag is packed, put it in a pocket in the carry-on bag you can easily access, and make sure that the sizes you bring are TSA-approved. When you travel, bringing one of the best toiletry bags can help you stay organized, prevent spills, and keep you feeling fresh and ready to go. Next time you go on a trip, use this guide to help you find the toiletry bag that is perfect for your needs.